More than 600 students in the undergraduate medical curriculum are taught each year by the Department of Ophthalmology with teaching occurring in 3rd, 4th, 5th and 6th years of the courses. In total each medical student spends more than two weeks being exposed to clinical and theoretical aspects of ophthalmology, which are then used in many other sub-specialty attachments. In addition more than a dozen medical and science students undertake extended clinical or research attachments each year. All fifth year students are also taught basic vision assessment techniques in conjunction with the Department of Optometry and Vision Science. There are over 200 students within the undergraduate optometry program. The final year optometry students are involved not only in the delivery of primary ophthalmic care, working in both the Grafton and Tamaki clinics, but also undertake community vision screenings. With the change in legislation allowing optometrists to prescribe a number of therapeutic agents, the interaction between the Department of Optometry and Vision Science and the Department of Ophthalmology has significantly increased. Undergraduate teaching by the Department of Ophthalmology is undertaken in part III and IV of the optometry program including both didactic and clinical teaching within a hospital setting. The Department of Ophthalmology is heavily involved in the clinical training of eight local vocational registrars each year who are pursuing fellowship of the Royal Australian and New Zealand College of Ophthalmologists. In addition five clinical research fellows from as far afield as the UK, Germany, Bulgaria, Brazil and the USA undertake advanced clinical and surgical training each year. The department has state of the art teaching facilities including the Calvin Ring Microsurgical Wetlab and works closely with the Ophthalmology Department at Greenlane Hospital and a number of private ophthalmic practices in Auckland. The development of a large active postgraduate program has provided an additional career option for optometry graduates to pursue. In addition, it has become an avenue of increased collaboration on the research front between different laboratories involved in vision research. Postgraduate supervision is becoming interlaced between the various members of NZ-NEC. The postgraduate teaching also involves assessment and award of postgraduate diplomas. The legislation changes allowing optometrists to use a range of therapeutic agents has not only meant a change in the undergraduate teaching, but also the development of a postgraduate ocular therapeutic course. This course is undertaken in conjunction with the Department of Ophthalmology, which provides about one half of the didactic component. The postgraduate students also undertake clinical rotations within a hospital setting and in private ophthalmology clinics. Such interaction has been conducive to establishing and developing close collaborations not only between the academic departments but also between the two ophthalmic professions. The life-blood of research productivity in any university remains the interaction between experienced mentors and up and coming researchers, particularly those pursuing research degrees in the form of masters (MSc) and doctorate degrees. The members of the NZ-NEC provide postgraduate opportunities in the full range of laboratory and clinical based higher degrees including Doctor of Philosophy (PhD) and Doctor of Medicine (MD). The breadth of research experience offered by NZ-NEC optometrists, scientists and ophthalmologists is unparalleled in Australasia and enables the completion of projects covering all aspects of the clinical and visual sciences related to the eye and vision apparatus – from the skin of the eyelids to the inner recesses of the occipital lobe of the brain. 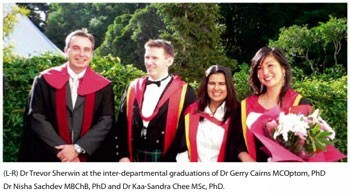 Indeed, at the present time some 30 postgraduate students are undertaking, or have just completed, PhD and MD research studies in the departments of the NZ-NEC, making it one of the larger vision science research centres internationally.